Murder trials have long been a subject of sensational treatment in popular culture, and murder trials involving women, as the accused or the victims, especially so. The latest exhibit from the Yale Law Library’s Rare Book Collection features 19th-century illustrated pamphlets that document the public’s fascination with these trials. 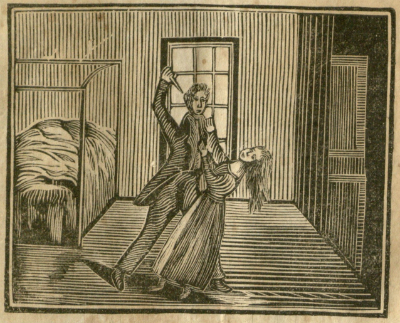 The exhibit, “Murder and Women in 19th-Century America: Trial Accounts in the Yale Law Library,” is curated by Emma Molina Widener (Department of World Languages, Southern Connecticut State University) and Michael Widener (Rare Book Librarian, Yale Law Library). It is on display through February 21, 2015, in the Rare Book Exhibition Gallery, located on Level L2 of the Lillian Goldman Law Library, Yale Law School (127 Wall Street, New Haven, CT). The exhibit can also be viewed in the Rare Book Collection’s Flickr site. Murder trial pamphlets are a rich source for studying popular culture and the history of the book, as well as legal history. Trials involving women are especially valuable for the study of 19th-century gender roles. With the exception of slavery trials, no genre of 19th-century legal literature is better served by research tools than murder trials.